Make sure the oil levels in both front fork legs are equal. Uneven oil levels can result in poor handling and a loss of stability. Before assembling the front fork leg, make sure all of the components are clean. 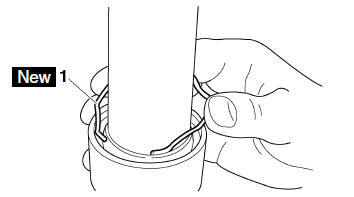 Allow the damper rod to slide slowly down the inner tube until it protrudes from the bottom of the inner tube. Be careful not to damage the inner tube. 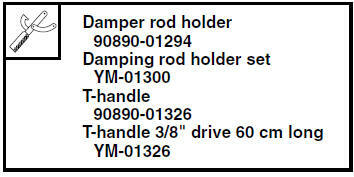 While holding the damper rod with the damper rod holder "2" and T-handle "3", tighten the damper rod bolt. Make sure the numbered side of the oil seal faces up. Before installing the oil seal, lubricate its lips with lithium-soap-based grease. Lubricate the outer surface of the inner tube with fork oil. Before installing the oil seal, cover the top of the front fork leg with a plastic bag to protect the oil seal during installation. Adjust the oil seal clip so that it fits into the outer tube's groove. Be sure to use the recommended fork oil. Other oils may have an adverse effect on front fork performance. 9. After filling the front fork leg, slowly stroke the inner tube "1" up and down (at least ten times) to distribute the fork oil. Be sure to stroke the inner tube slowly because the fork oil may spurt out. 10.Before measuring the fork oil level, wait ten minutes until the oil has settled and the air bubbles have dispersed. Be sure to bleed the front fork leg of any residual air. Front fork leg oil level "a" (from the top of the inner tube, with the inner tube fully compressed and without the fork spring) Out of specification Correct. Install the spring with the smaller pitch "a" facing up. Before installing the front fork cap, lubricate its O-ring with grease. Insert the front fork cap into the inner tube, and then install the clip, making sure that the cap is securely held in place with the clip.